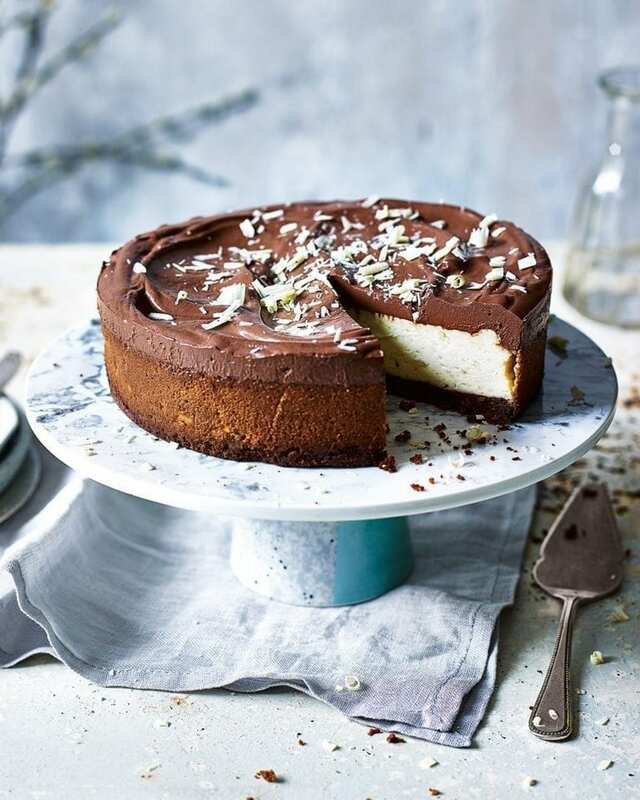 Who can resist a creamy New York cheesecake with a buttery biscuit base and covered in a rich chocolate topping? Not us. Firmly and evenly pat the biscuit mixture into the bottom of the prepared cake tin. Chill for 30 minutes. Heat the oven to 180°C/160°C fan/gas 4. For the filling, put the cream cheese, sugar and soured cream into a large mixing bowl and beat with a wooden spoon until well combined and smooth. Beat in the eggs one at a time, adding the vanilla and the flour with the last egg. Pour the filling over the chilled biscuit base, then put the cake tin onto a baking sheet and bake for 45-50 minutes until the top is golden and firm at the edges but the centre still has a good wobble. Turn off the oven, open the door slightly and leave the cheesecake to cool in the oven for an hour. Remove the tin from the oven and allow the cheesecake to cool to room temperature, then put in the fridge to cool completely. For the chocolate topping, put the chocolate into a medium heatproof bowl set over a pan of barely simmering water (don’t let the water touch the bottom of the bowl). Allow the chocolate to melt, stirring occasionally. When the chocolate has melted, stir in the soured cream until just combined. Allow the mixture to cool (but not set), then pour it over the cheesecake, spreading it evenly using a spatula. Chill in the fridge to set for 45-60 minutes. Just before serving, top the cheesecake with the white chocolate shavings. Cooling the cheesecake in the oven (step 4) should minimise cracking, but don’t worry if it does crack – the topping covers it. Make the whole thing up to 48 hours in advance and keep covered in the fridge.